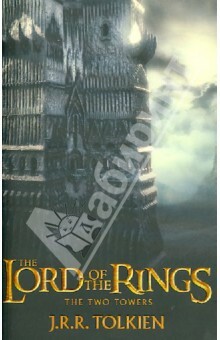 The Lord of the Rings: The Two Towers Harper Collins UK Frodo and the Companions of the Ring have been beset by danger during their quest to prevent the Ruling Ring from falling into the hands of the Dark Lord by destroying it in the Cracks of Doom. They have lost the wizard, Gandalf, in the battle with an evil spirit in the Mines of Moria; and at the Falls of Rauros, Boromir, seduced by the power of the Ring, tried to seize it by force. While Frodo and Sam made their escape the rest of the company were attacked by Orcs. Now they continue their journey alone down the great River Anduin - alone, that is, save for the mysterious creeping figure that follows wherever they go. JRR Tolkien's great work of imaginative fiction has been labelled both a heroic romance and a classic fantasy fiction. By turns comic and homely, epic and diabolic, the narrative moves through countless changes of scene and character in an imaginary world which is totally convincing in its detail. Аннотация к книге "The Lord of the Rings: The Two Towers"
Now they continue their journey alone down the great River Anduin - alone, that is, save for the mysterious creeping figure that follows wherever they go. Наверное не осталось таких людей, которые ничего не слышали про "Властелин Колец"! Вы наверняка читали трилогию или смотрели фильмы, поэтому знаете, что "The Two Towers" - это вторая часть эпической истории. Книга на английском языке читается достаточно легко. Конечно, вы встретите много новых слов, хотя бы потому, что у г-на Толкина свой особенный язык! Но, согласитесь, ничто не сравнится с прочтением книги на языке оригинала!!! Никаких сокращений от переводчика, никаких неточностей! Похожие на "The Lord of the Rings: The Two Towers"
Если вы обнаружили ошибку в описании книги "The Lord of the Rings: The Two Towers" (автор Tolkien John Ronald Reuel), пишите об этом в сообщении об ошибке. Спасибо!